Q: According to reports, Australian Prime Minister Scott Morrison announced on November 8 that his country will offer an infrastructure fund worth 2 billion Australian dollars to the Pacific Island countries. Analysts say that Australia's plan aims to counter China's influence in this region. Meanwhile, we also noted that State Councilor and Foreign Minister Wang Yi and Australian Foreign Minister Marise Payne held the China-Australia Diplomatic and Strategic Dialogue yesterday. How do you look at the relations between China and Australia on the issue of the Pacific Island countries? A: Yesterday, State Councilor and Foreign Minister Wang Yi and Australian Foreign Minister Marise Payne held the 5th round of the China-Australia Diplomatic and Strategic Dialogue in Beijing. We have released the relevant information. Foreign Minister Payne made positive statements on China and China-Australia relations, saying that Australia welcomes the contributions made by China to the region and the world through opening-up and development and that a prosperous China is positive to the world and it is natural for China's influence to grow stronger. 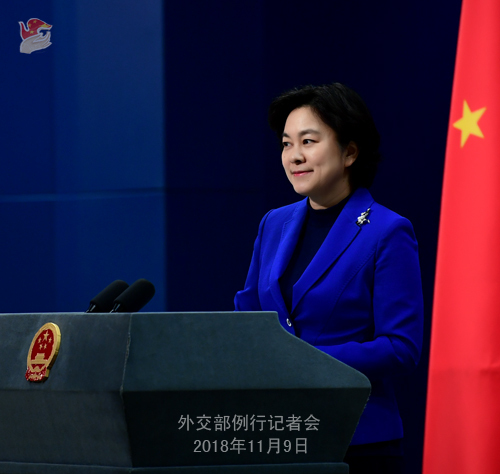 She added that the new Australian government under the leadership of Prime Minister Morrison is committed to deepening the Australia-China Comprehensive Strategic Partnership and enhancing dialogue and cooperation on the basis of respecting each other's differences. State Councilor Wang Yi said that the most important outcome of this round of dialogue is that we have clarified the right course of China-Australia relations which should set sail again after recalibration. The Chinese side appreciates the remarks of the leaders of the new Australian administration that Australia views China's development as an opportunity instead of a threat and is committed to developing long-term constructive partnership with China. The Chinese side hopes and believes that the Australian side will translate the positive will of developing ties with China into concrete actions. Regarding the relations between China and Australia on the issue of the Pacific Island countries, I would like to stress that the cooperation between China and the Pacific Island countries is South-South Cooperation as well as the mutual support and assistance between developing countries and friends. China, Australia and the Pacific Island countries all belong to the big Asia-Pacific family. Both China and Australia hope that the Pacific Island countries can enjoy sound development. We can surely leverage our respective complementary strengths to make contributions to the development and prosperity of the Pacific Island countries and join hands to help them realize sustainable development. Q: According to reports, the German newspaper Bild on November 8 published an article entitled "China Has Put Africa into Its Pocket So Unscrupulously", accusing China of "bugging" the African Union headquarters and saying that China's aids to Africa are aimed for political influence via unethical means. What's your comment on that? A: I have seen relevant reports. They are entirely nonsense and nothing new. The false accusations of China bugging the African Union headquarters have already been refuted by various parties long ago. Chairperson of the African Union Commission Moussa Faki Mahamat and the leaders of Ethiopia, the Republic of the Congo and other African countries have already clearly said that those reports are nothing but lies. This German media agency is obviously playing up this issue with ulterior motives. The African people have the best say about China-Africa cooperation. At the Beijing Summit of the Forum on China-Africa Cooperation (FOCAC) in September and the 73rd United Nations General Assembly, many African state leaders denounced the absurd accusations that China-Africa cooperation has increased debt burdens of African countries and made it clear that their countries need development, funds and cooperation. China doesn't attach any political strings or interfere in their domestic affairs when providing support and assistance. They welcome and thank China, deeming it the most reliable partner for Africa in pursuing development and revitalization. Not long ago, in his visit to Namibia, former President of the German Parliament Norbert Lammert claimed that he is concerned about China's growing influence in that country. Namibian President Hage Geingob said it to his face that the so-called concern certain country has about Chinese influence in Namibia is annoying. Please don't underestimate the intelligence of the African people and they know how to deal with their own affairs. We hope relevant media agencies will correct their mindset and report China's cooperation with African countries in a fair and objective manner. If they continue to fabricate lies in disregard of basic and fundamental facts, they will end up in harming their credibility and disgracing themselves. Q: According to reports, senior US intelligence official on November 8 said China has been violating an agreement made with the Obama administration to end commercial cyber espionage. Do you have a comment on this? A: The relevant accusation by the US side is groundless and the Chinese side firmly opposes it. China and the US share important common interests in the field of cyber security. In recent years, the two sides have carried out effective exchanges and cooperation on the basis of the 2015 cyber security consensus. 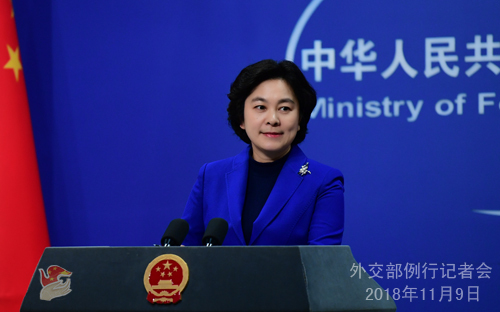 We urge the US to stop its unfounded accusations against China and meet China halfway to jointly safeguard the momentum of exchanges and cooperation in the field of cyber security between the two countries. Q: What expectations do you have for the China-US Diplomatic and Security Dialogue? A: The second round of China-US Diplomatic and Security Dialogue will be held soon. We look forward to good outcomes from this dialogue. Follow-up: Do you have any more details about what the two sides are going to discuss? What results are you hoping for? A: After the dialogue, the two sides will release the information in a timely manner. Not long ago, the two heads of state of China and the United States had a telephone conversation and instructed the working teams from the two sides to step up contact and conduct consultation. We hope that the two sides can act on the important consensus reached by the two heads of state and enhance mutual understanding, properly manage differences and promote dialogue and cooperation through equal-footed and friendly exchanges and consultation to ensure that the meeting between the two heads of state in Argentina will achieve positive outcomes. We believe that this meets the shared aspirations of the two sides. Q: According to reports, the Financial Times reporter Victor Mallet recently tried to enter Hong Kong again as a visitor but was turned away. Did the central government tell the Hong Kong authority to ban him from entering Hong Kong? A: The government of the Hong Kong Special Administrative Region has the right to exercise administration over the entry, stay and exit of people from different countries and regions in accordance with the "one country, two systems" policy and the Basic Law of the Hong Kong Special Administration Region. As journalists who travel around the world, you must be aware that countries deny or approve the entry of visitors in accordance with their law on entry and exit administration. This is quite normal. Due to scheduling reasons, the promotion event for Heilongjiang Province will be held at 4:30 p.m. on November 12. Journalists registered for this event are kindly reminded to take note of the time adjustment. We look forward to your attendance at and coverage of this event. The regular press conference of the Foreign Ministry will be adjourned on that day. You may reach the Spokesperson's Office of the Foreign Ministry with your questions by phone, e-mail, fax and WeChat.